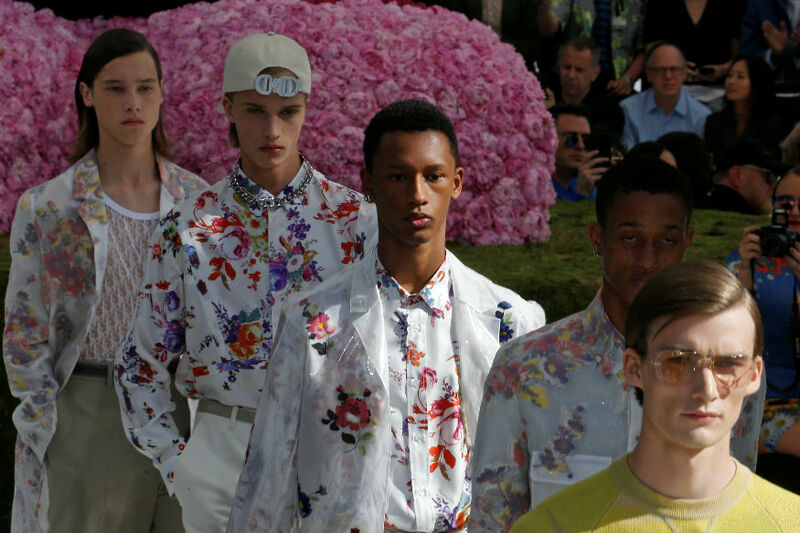 The Spring/Summer 2019 menswear shows have shimmied their way through London, Milan and Paris over the past few weeks, with some of the biggest names in the fashion industry putting their spin on beauty and hair trends for the upcoming season. The catwalks were full of bright, vibrant hair colors, from bleach blonde cropped styles at Frankie Morello in Milan, to the metallic silver wigs seen at the "Man" show in London. Maison Margiela spray painted the hair every color from gold to royal blue in Paris, while Facetasm opted for fluffy hairpieces in more muted tones. The natural beauty look remained a key trend during the Spring/Summer 2019 shows, but eyeliner made a dramatic appearance on more than one occasion. Paul Smith kepth things grungy and a little smudged, while Maison Margiela opted for a winged flick, and a razor-sharp look made for a polished vibe at GMBH. Of course, it wouldn't be fashion without a dash of the theatrical, and this season didn't disappoint. Rick Owens took an abstract approach to catwalk beauty, covering some of his models' faces with embellished stockings that doubled up as striking masked accessories, while face paint was the main makeup tool used at Walter Van Beirendonck's show. Chinese designer Xander Zhou teamed his futuristic collection with kooky, sculpted hair pieces, unconventional facial accessories and angular sunglasses.